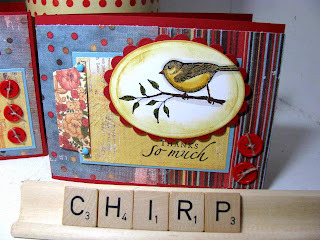 I'm so in love with this Unity "Birds of a Feather" stamp set because of its versatility; I can't believe what a great value it was. It covers birthday, fall, Christmas and spring! I scored this set on my last trip to the Pine City Scrapbooking Company last month; I haven't been able to find Unity Stamps anywhere around St. Paul, so I had to snap it up when I found it!! I'm just getting around to posting these; I made them last month at a get-together at Archivers and cranked a bunch out for Christmas cards this year. 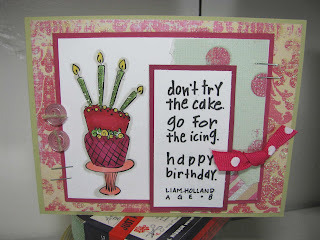 I used a Justrite monogram stamper to spell out the sentiment and a nestability circle & scallop die. 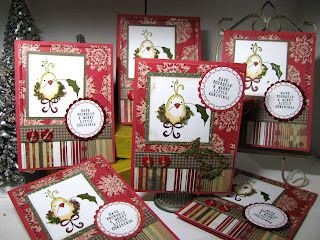 Here's my Vintage Christmas flowersoft obsession again! Minimal coloring on these babies! I used Milky white and buttercup yellow to just outline the dove. Are you Christmas shopping today? Remember to be merry! 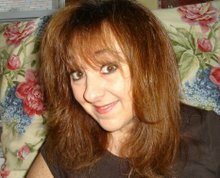 Short and sweet, I am thankful for YOU, my faithful readers! Still playing Pink Persimmon! 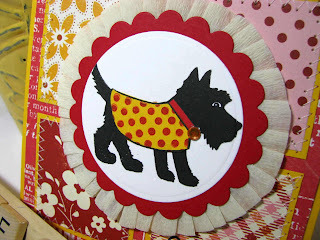 I love these little scottie dogs and decided they needed to get decked out for Christmas! 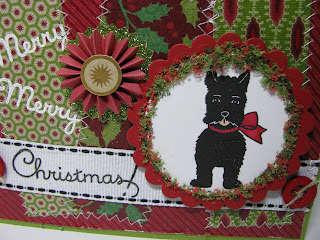 I used a K & Company Christmas Cheer mat pad for the background papers, and then stamped the scottie dog in a nestabilities circle. 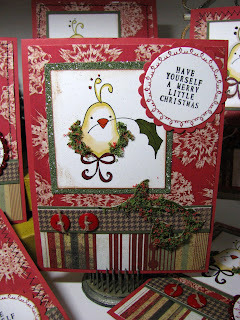 I also had to use some of my vintage christmas Flowersoft around the edges of the image. 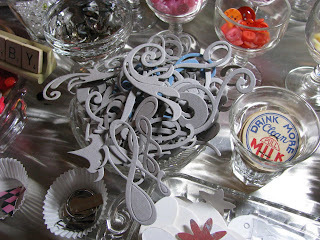 Note: when you glue this on, you'll want to use diamond glaze, crystal effects or Aleene's glue to glue it on. 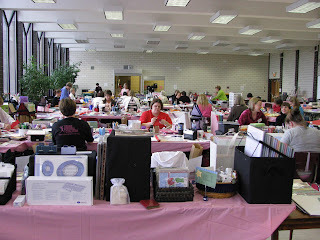 Make sure you use a thick glue to insure that all of that flock stays on the image securely! 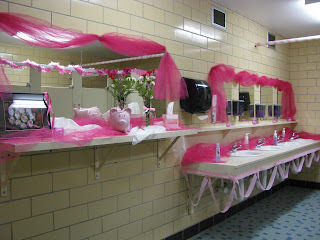 I am now officially a flowersoft ADDICT! Dang, I totally forgot to post these Bubs the Beaver cards that I made for the grand opening of Our Craft Lounge! This is one of my faves from the newly released OCL sets. 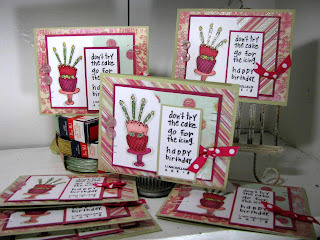 I'm SO going to make some belated birthday cards with it when I get a chance. 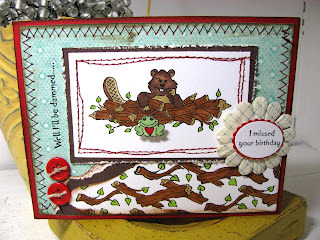 I created a little patterned paper 'dam' of logs with the log from this set, and tore & distressed it along the edges. 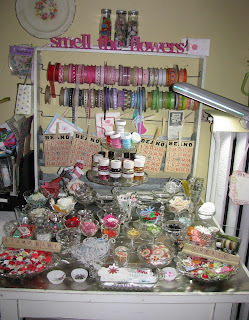 I also sewed around the focal image and added a matchy flower for the sentiment. 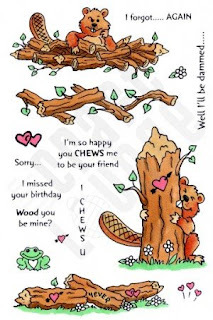 For this card I thought it would be fun to use my nestabilities scallop die to take little 'bites' around the edges of the image, so it looks like the beaver chewed on the card! 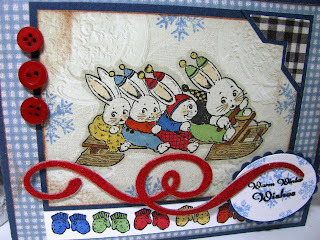 I'm so enamored with these little bunnies from Crafty Secret's new Snowbunnies set! Look at how sweet that little mama bunny is, tying a scarf around the little one! 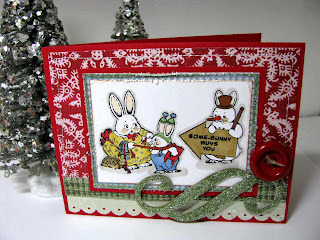 I added a little snowman-snowbunny to the background to hold my sentiment, too. I'm not so great at coloring background scenes, so I kept it simple on this one. I figure the background is white, right? SNOW! 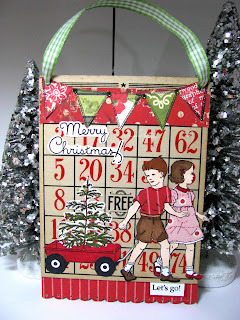 I also added one of those little chipboard swirls with Martha Stewart green glitter on it for sparkle. 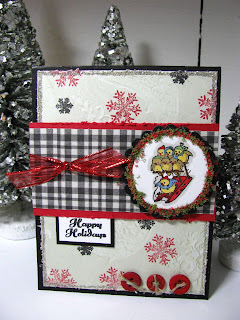 I love that it has been flurrying here in MN; it makes me want to stamp Christmas and winter cards! 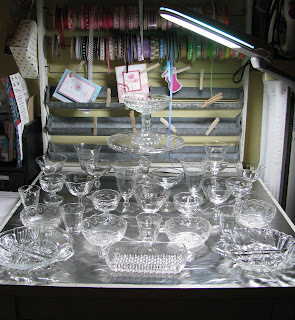 This weekend I buckled down and shoveled out my stamp room; I'm getting into that winter 'nesting' mode, and pulling out xmas decor and christmas lights. This year will be low-pressure as far as gift-giving goes; our family has decided that we have everything we need and more, and are going to just do white-elephant gifts this year. Are y'all cutting back also? I already feel less stress and pressure ...I feel like I'm really going to take my time and enjoy the holiday this year~! Happy Tuesday, all! 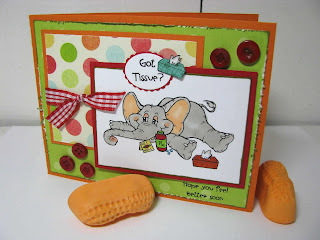 I've got another sample to show you from Our Craft Lounge tonite! I was trying to crank out two cards for each of the sets I received, but for some reason this card took me longer than normal and I finally had to put the giraffes away and call it a night! I love that most of OCL's sets do double duty, and you can use them for more than one occasion! I love how well-thought out all the sets are! WAY TO GO GIRLS! 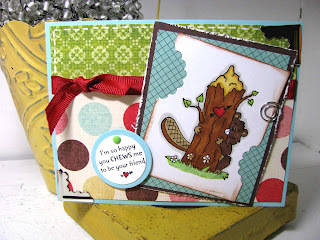 This set is called Tree-mendous love, and can be used for baby cards, valentines, or just a happy-hello type card! 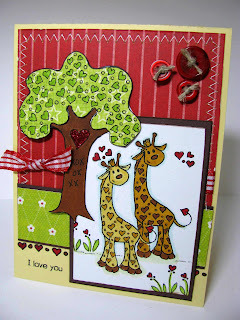 I decided to do 2 lovey-dovey giraffes; my first thought was to intertwine their necks, but I was fully into a sinus infection meltdown when I made this and just didn't have the brain capacity at the time! I bet you could just shape the necks on your block to intertwine them. DUH. I'll have to try again another day! 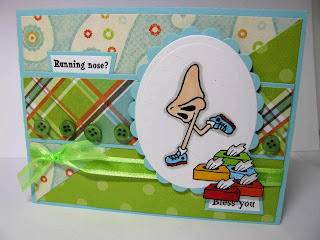 So this is the card that I ended up doing. 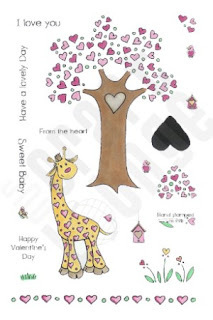 I paper-pieced the leaves of the tree onto green My Mind's Eye Patterned papers, then colored in the hearts a little darker green so that they pop off the paper. I also had to draw some little x's and o's carved into the tree. I don't think you can see it well on the photo, but the heart in the tree is bright red sparkly glitter! 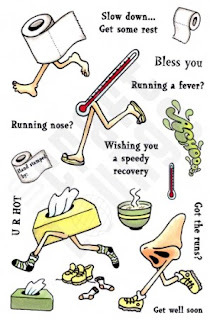 Hope your week is flying by, I can't believe November is 1/2 over already! Where has this month gone? GASP! 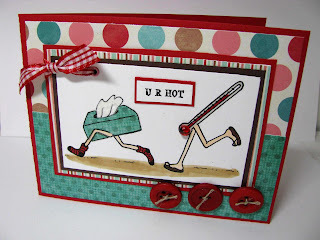 Tonite I'm posting more of my cranked-out cards from last week. 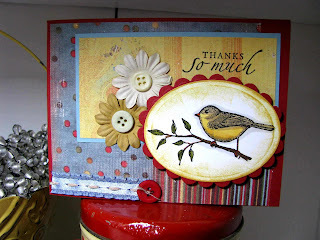 I pulled out my "Touch of Nature" Stampin Up set because I love this bird from it so much & am in desperate need of birthday and thank-you cards! 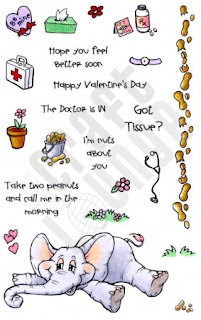 I use this set on tons of different cards; thank you, sympathy, birthday, get well. 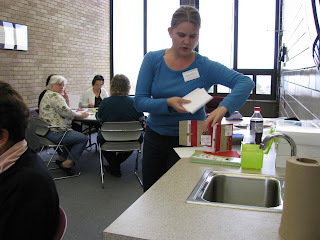 The papers are from a Daisy D's 8 x 8 Beacon Hill paper pack that was gifted to me by some friends at a retreat I went to a few years ago. 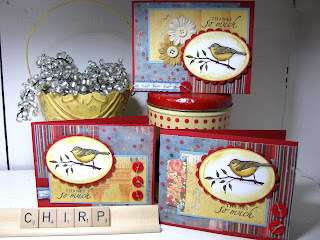 I'm sort of liking this color combo of yellow, blue and ruby red cardstock; when I choose my colors, I usually pull the colors out of one of the patterned papers that I'm using on the card. 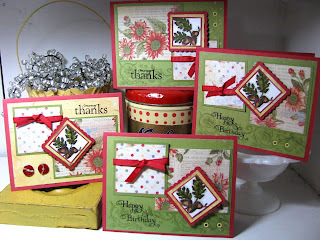 For these cards, I pulled from the blue polka dot paper on the left. 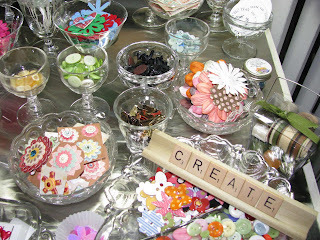 I've got tons of stuff to show you guys this week, I have more Our Craft Lounge Samples, Crafty Secrets and Pink Persimmon! I'm crankin' girls, just crankin! 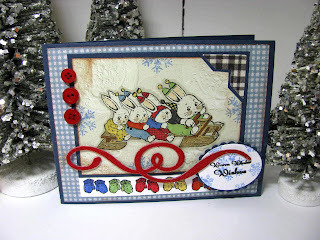 Tonite's card is a simple one I made with the Crafty Secrets "Snow Bunny" stamp set again. 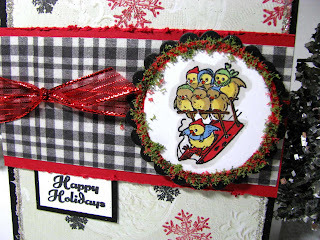 This little sledding chick image is adorable, and a perfect size for using in the nestabilities circle dies. 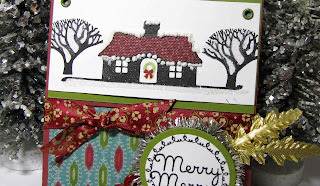 I used black and red for this card, and stamped snowflakes all over a patterned paper that I got from a Crafty Secrets Paper pad. The paper is mainly white and has raised swirls in it, which made me think snow flurries. So I added more of them in red and black to match my gingham. 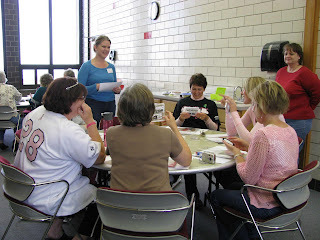 I also used a cool new product that I bought at the Pine City Scrapbooking Co; it's called "Flower Soft" and is this funky, netty-type stuff that you use to simulate flowers or holly. Their website is HERE if you're interested...I just bought the Vintage Christmas color for holly and wreaths, etc., but I have a feeling I'll be going back for more of the pastel flower colors of it too! 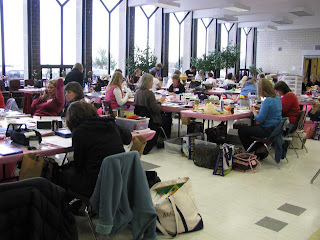 You just glue it to your images with a liquid glue pen, like you'd adhere glitter or flock. I press it down into the glue to make sure it sticks well. 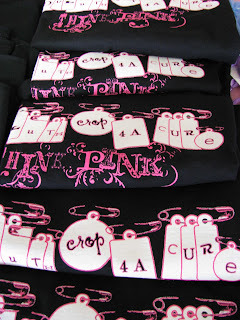 COOL STUFF! It's UP! It's UP! Two new fab dirty girls, Bev Rousch and Joanne Basile have been announced in the Dirty Dozen gallery this month over at Splitcoast stampers! Congrats to you both, sweet girlies! You will ROCK Splitcoast! 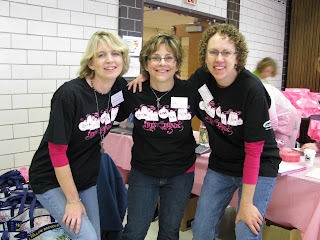 If you don't subscribe to the Dirty Dozen Gallery and want to check out their blogs, you can find Bev Rousch HERE and Joanne Basile HERE! 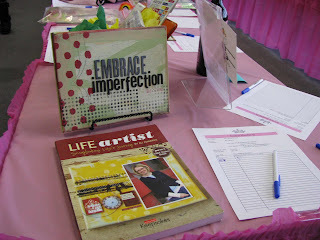 This month's theme in the gallery is "Chick Lit", which has SO MANY interpretations to it! Did you guys know that if you subscribe to the Dirty Dozen gallery, you can play along with the monthly themes? It's called "fan club interactive", and you're able to upload your own creations once the theme is announced! 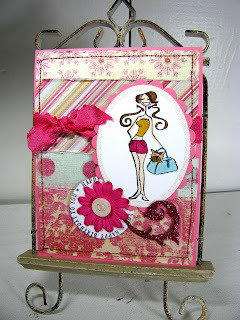 This is one of the projects I was going to post to the Dirty Dozen gallery this month, but it didn't quite make it in. I decided it didn't fit the theme enough, so I thought I'd post it here instead. 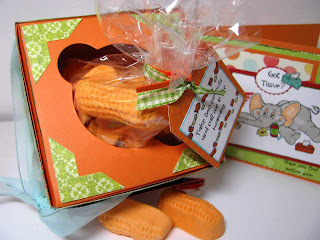 When I was thinking literature, I thought of kids studying at school, and decided to do a little candy or snack- themed gift that you could give to a studious kid. 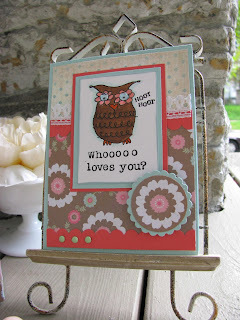 I found this cute Autumn Leaves Owl image in the Archivers $1.99 spot, and then used some Studio G alphabet stamps to stamp 'whooo loves you' on the card. 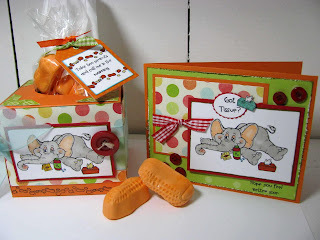 Last month in the gallery I introduced a new box that I created with some cool candy boxes that were gifted to me from Lana Lepinski (Nashville Wraps Boxes). 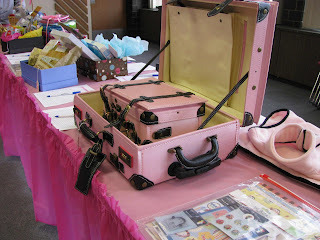 They are cute, shiny boxes that you'd put truffles or candy in to give as gifts! I decided to attach a little 'billboard' type piece of cardstock to the back of the box, to create a little standing 'billboard' for your sentiment & image. 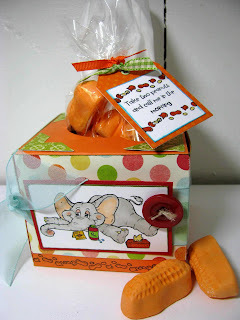 My inspiration for this was the little hang-style boxes that aspirin or chapstick comes in at the store. 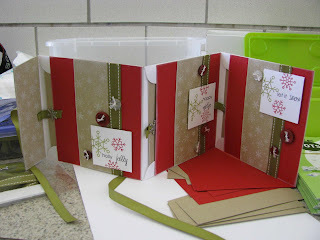 These are so easy; you can alter any box by just adding cardstock to the back of it with Killer Red Tacky Tape (red-line tape). I also cut the top out of the box and added a transparency window so you can see the candy inside. Strawberry Whoppers! YUM! 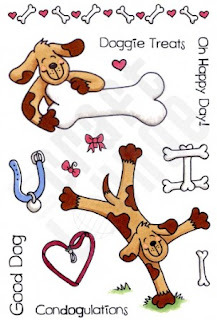 This set is called "Pat the Good Dog", and looks like it's going to be a fun one to use for dog treats and all-occasion cards! Here are some of the cards I did with the set. I took a transparency sheet, stamped white bones on it with white stazon, cut it out with a round nestabilities die, and then added it to the top of a red circle of the same size. 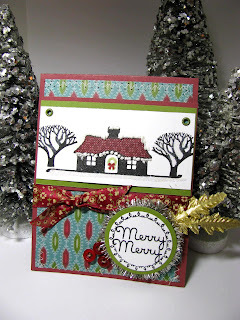 I also used Darice Clear Luster Gems and colored them in red to match my paper. It was fun to stamp the little bone border on my patterned paper, and then color them in with a white Ranger inkssentials gel pen. 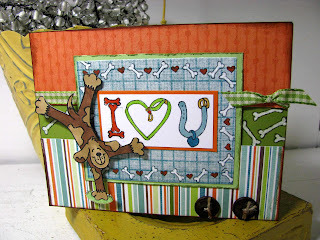 I also fun-flocked (Stampendous) the green grass! All papers are by My Mind's Eye. 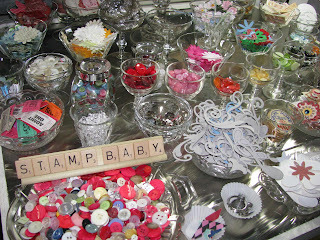 Stamps by Our Craft Lounge. YAY, IT'S FRIDAY! 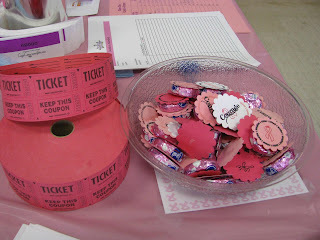 CONGRATS, SWEET GIRLS, THANKS FOR LETTING ME BE PART OF YOUR FUN FUN DAY~! Oh man. 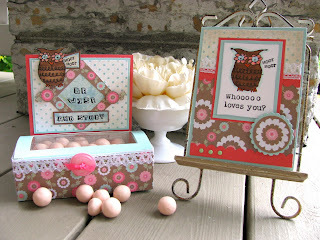 I've fallen head over heels in love with a new stamp company, called Pink Persimmon! I can't believe all of the new, cool stamp companies that are popping up all over the place! I saw a link on Splitcoast stampers the other day for Pink Persimmon, and when I saw these stinkin cute scottie dogs, I HAD to have them! It was instant love, especially when I discovered that their stamps are the same quality photopolymer as Crafty Secrets & Papertrey. I'm so SNOBBY when it comes to the "smushiness" factor..these are SOLID, baby! 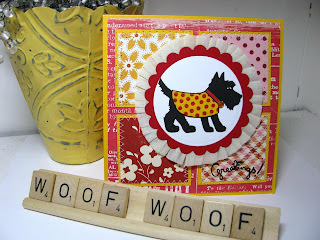 I used Neenah Solar White cardstock and black Palette ink & the doggie just POPPED! 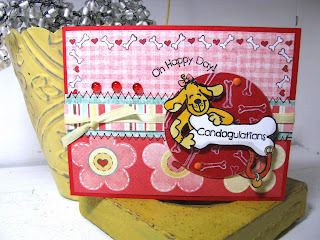 I'm not gonna lie, I do NOT own the cute patterned papers behind the doggie. They were 4" x 4" sample sheets that I got at CHA at the October Afternoon booth! 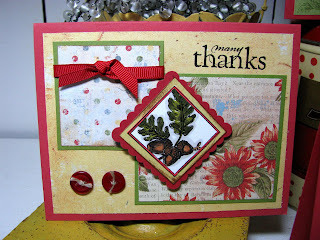 No one around here really carries October afternoon, so I was FORCED to use my sample swatches for this card! They were just too perfect! I also used a new color of Mark Richards Crystal Bling Stickers..they come in ORANGE now! So I gave our doggie here an orange bling dogtag, for sparkle. 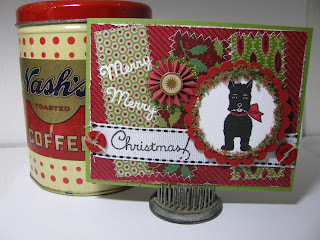 I also used vintage crepe paper around the center image & ruffled it around the doggie. Happy Monday, all! L.